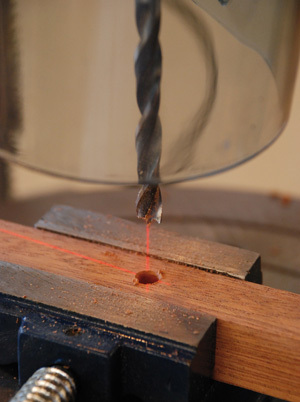 Technology has come to the simple pillar drill, but more of that later. First things first and I'm pleased to report that this one comes well greased and the components are easy to assemble thanks in part to the instructions, but you will need a mate to help you lift and mount the main head on its column. A solid piece of kit, it comes with a good rack and pinion table which can be moved out of the way easily. The rack and pinion thread is locked at the top with a collar and small Allen screw, so is easy to loosen off. Being designed for engineers using vices, irritatingly, pillar drills usually have flange all the way round, making clamping difficult, but this one is circular and flat underneath so is ideal for use with G- and F- clamps. Ryobi even mark out clamp positions so full marks here. The table is an agreeable size at 273mm, and has a useful, heavy, lockable tilt to 45 degrees. The variable-speed motor goes from 500 to 3000rpm. Beltless, it is changed while the drill is running via a lever on the left-hand side. A digital readout on the front tells you what speed you are running at as it changes, so no scrabbling about in the top of the drill changing belts and pulleys! The instruction manual contains a handy drilling chart for the recommended speeds for different materials. Besides the usual depth stop arrangement you get a spindle lock, a useful worklight, a vice and the obligatory laser which in this case works a treat; in the form of a cross, it can be adjusted on each side, allowing you to centre the bit. The chuck is spring-loaded on its point to self-eject if you should leave it in - another nice touch. This is a well thought out, accurate and satisfactorily put together drill with some very good features, and this sophistication and smoothness makes the price justifiable. 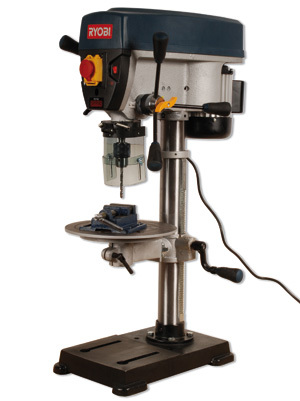 What really stands out is the table with its flat base, making this model the ideal woodworkers' pillar drill. "This is a well thought out, accurate and satisfactorily put together drill"